In the fall of 2013, GEM Advertising was invited to pitch a branding and web development project for Vancouver-based North Pacific Yachts, a yacht manufacturer with clients worldwide. By cutting out the middlemen, reducing overhead, and using state-of-the-art technology, North Pacific Yachts had discovered a way to make yachts of exceptional craftsmanship and seaworthiness at up to half the price of alternatives on the market. However, the aggressive pricing brought out critical comments by competitors, who downplayed North Pacific as a “value” brand with inferior products, even though the lineup was built to incredible standards. The challenge was getting potential buyers to investigate North Pacific more thoroughly so that they would see for themselves the outstanding quality of the yachts. North Pacific Yachts - Stunning at every degree. The tagline captured the brand’s diverse array of competitive advantages, including stunning quality, exceptional craftsmanship, seaworthiness, price, and customer service. In addition, the tagline alluded to the fact that the yachts are long range vessels capable of cruising at every degree of longitude and latitude in the world, and at every degree of the compass. Wherever you ventured, your North Pacific yacht was sure to be truly stunning at every degree. 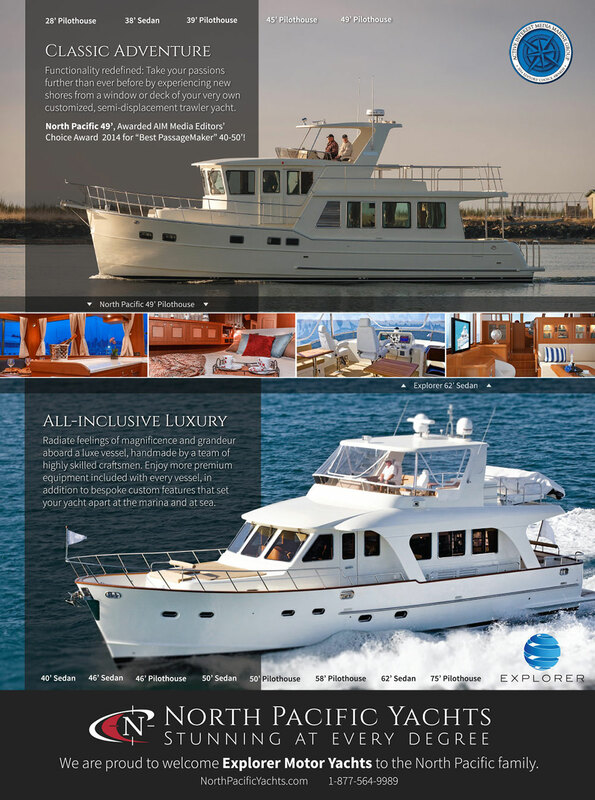 Next, GEM tackled a new website, new business card, new brochure, a takeaway for boat shows, and a video for the newest model launch, the 49 foot Pilothouse. The new website was built around the idea of a “dashboard,” which would eliminate endless scrolling. Like the helm of a yacht, users could access all of the information they needed from their central dashboard, where information would appear and unfold seamlessly. In addition, GEM built the dashboard around a central screen of high-resolution images so that the yachts would be the center of attention at all times. GEM built an interactive quiz so that users could find their ideal model. To create an interactive guide, GEM added a quiz titled “Which model is right for me?” Using the quiz, visitors could select their style of boating in a series of questions which would direct them to the first and second-best choices in the North Pacific fleet, making it easier for visitors to distinguish between the boats in a fun, engaging way. Next, GEM instituted a “Process and History” section so visitors could learn more about the brand in depth, including the stringent quality and craftsmanship guidelines of the model lineup. GEM also included a Press archive for prospective customers to see what critics are saying about the North Pacific builds. Throughout the materials, GEM incorporated fun design elements for savvy visitors. For instance, the nautical flags in the web navigation spell out the letters N-O-R-T-H. The boat show takeaway was die-cut in the outline of a 49 foot Pilothouse so that visitors would take notice of the handout versus the square materials of other manufacturers. The new brochure took design influence from coffee table books, in order to relate the craftsmanship of the book to the craftsmanship of the yachts in the mind of a serious buyer. In addition, the stunning images of the book made it hard to throw away; instead, those who received the brochure would keep it on their coffee table at home or, better yet, aboard their current boat on display. Printed booklets detailing the craftsmanship of each model were crucial informational and showcasing tools. Unique print items, such as this die-cut card of a North Pacific Yacht, were fun items for potential customers to take at boat shows. Along with GEM's rebranding of North Pacific Yachts came a new set of business cards. Handouts and other print materials had to both inform and entice potential customers. 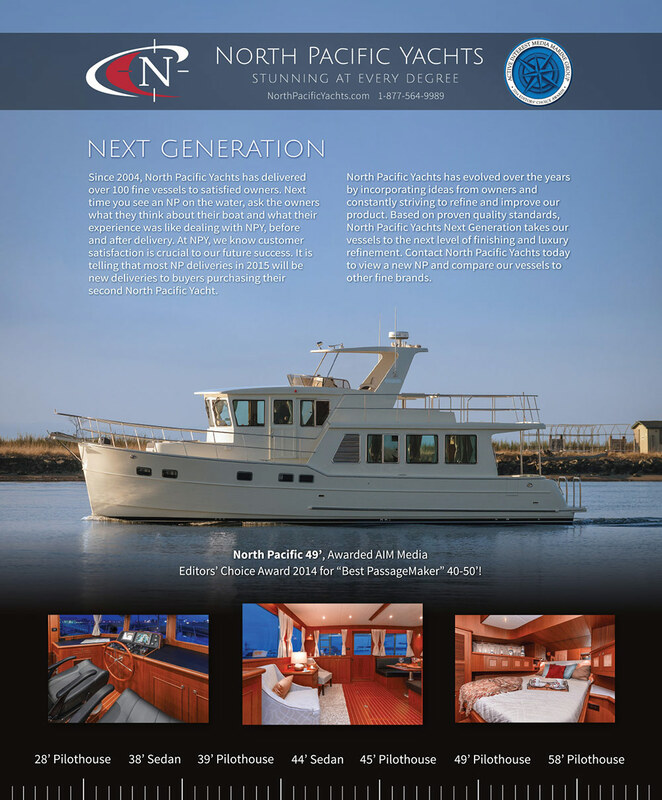 In addition to the brochure as a conversation piece, GEM created the North Pacific Owner’s Site with a variety of functions that would enhance both inbound and outbound communications. For instance, users could create personal profiles with photos that they could share and update in conjunction with other owners. 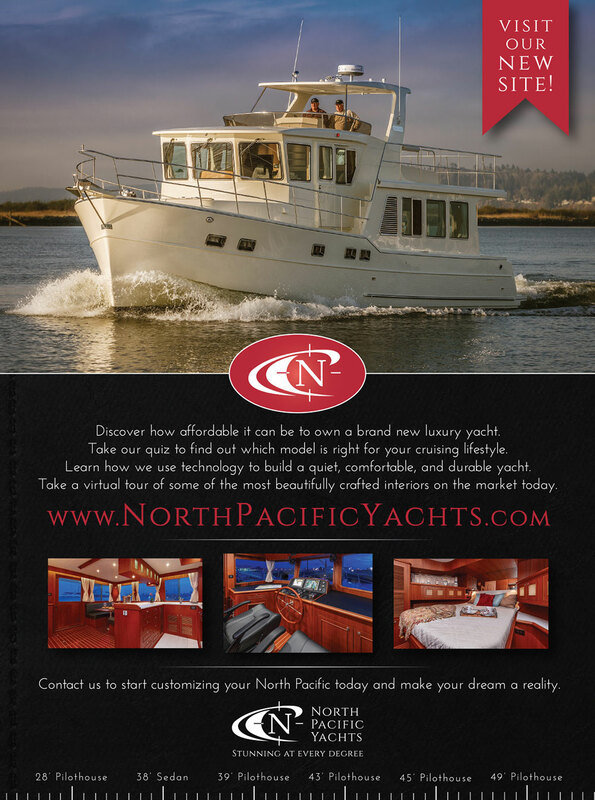 Finally, GEM designed print ads to reflect the new position of North Pacific as serious yacht players in the market, with beautiful photos, strong narrative statements, and a call to action to visit the brand new website. In keeping with the tagline, Stunning at every degree, GEM took a typical list of the model lineup and connected the models with a compass. Then, in the winter of 2014, GEM had the opportunity to work with Google Glass - the new wearable technology that connected external devices to a screen embedded right into your eyeglasses. On a rainy January day in Puget Sound, north of Seattle, GEM filmed a North Pacific 43 skipper wearing Google Glass. In the video, he uses the technology to check his engine, monitor his vessel systems, and otherwise stay connected to the helm without having to look down at his controls. The revolutionary video caught the attention of Active Interest Media - one of the top media conglomerates in the marine industry worldwide. The video was picked up by their own digital publications as well as in marine blogs, leading to hundreds of thousands of impressions. In addition, with its new branding in full swing, North Pacific earned three magazine covers throughout 2014 including Pacific Yachting, Sea Magazine and Passagemaker. By 2015, the North Pacific Brand was ready to launch into its next line of semi-displacement cruisers with its new Explorer Series of vessels, which is sure to be a success for many years to come. As time cruises on, GEM looks forward to working with North Pacific Yachts in a partnership that is truly stunning at every degree.